Despite its popularity as a religious holiday celebrated by billions of people, Christmas is not always an easy time for many enthusiasts. Same families may deal with a limited budget during the holiday season, some may not have anybody to celebrate Christmas with, some may become bored with Christmas altogether because of having done the same thing over and over year after year. 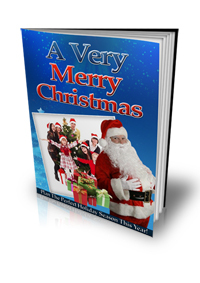 That's why my brand new guide "A Very Merry Christmas" is the perfect blueprint to help get your creative juices flowing! Let's take a peek at what's in store for you and how you can share in the joy of the most wonderful season of all. In this fun little guide, you'll learn of many different ways to make Christmas time a season to remember! Some of the things you'll pick up in order to get the best out of one of the most celebrated days of the year include.